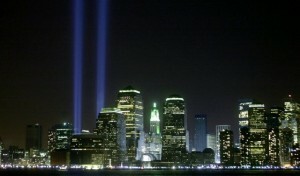 I will never forget where I was and how I heard the news. I was on my way to work in Virginia Beach and, while channel surfing on the radio, I somehow ended up listening to Mancow while I waited at the light to turn into my office’s parking lot. I remember him saying how a plane had crashed into the World Trade Center in New York City, and how he couldn’t understand how that had happened since it was a clear, beautiful day that Tuesday morning. At the time, I thought he meant a small plane, maybe a private plane, had crashed into the tower. Little did I know. By the time I walked into my office about three minutes later, all my coworkers were in a tizzy. I was brought up to speed very quickly, and all 16 or so of us tried desperately to log onto a news site, any news site, to find out what was going on. Finally, one coworker got through and was able to pull up live video on MSNBC.com. The video image was so small, and none of us huddled around that one computer could really comprehend what we were seeing. There was a lot of smoke and fire, but we couldn’t make out much more. A tower had been hit, we knew that. Then the second tower was hit. The reporters said something about the Pentagon. I vividly remember the sound of seemingly every fighter jet in Hampton Roads taking off within a matter of minutes. To this day, that is still one of the worst, most terrifying sounds I’ve ever heard. There was a report about yet another plane crash, this time in Pennsylvania. We were all stunned, not knowing what was going on, what target was going to be next. Watching that tiny video image, we all thought we saw an explosion. My desk phone rang a minute later, and I ran to grab it. No sooner had I said hello than my sister basically screamed, “The tower’s gone!” I didn’t understand what she was saying. “What do you mean, the tower’s gone?” I asked. She could barely talk, she was so upset. I remember her saying something about how it had pancaked, collapsing floor by floor. It was gone. I don’t remember getting off the phone, or relaying the news to my coworkers that we hadn’t just seen an explosion, we’d seen the tower collapse, but they all knew. They’d heard my side of the phone call. After that, things get a bit fuzzy. I remember my mom calling, crying, saying how she couldn’t get through to any of our relatives in the city. I remember my hands were shaking. My boss came out of his office and simply said, “Go home. Go home and pray for our country.” One of my coworkers told me he hoped all my family in the city was safe. That’s when I started to cry. I know I called Rich to tell him I was heading home. I don’t remember the drive, though. I got home and of course ran for the TV. I think by this time the second tower had collapsed. The news started rerunning the footage of the first plane hitting the first tower. Rich was home by then, and we watched that horrible image together. I remember thinking how easily that plane went into the building, almost like a hot knife into butter, and how horrific it was to watch. I fought back the urge to throw up. Time blurred after that. Rather, I lost track of time. I know almost every cable channel we had was covering the attacks; regularly scheduled programming ceased to exist. I know that at some point my mom called to say that our family was OK. Heartsick, devastated, and terrified, but OK. I found out one of my bookstore manager’s friends died in the Pentagon attacks. Another friend was actually in D.C., watching everything happen with her own eyes. I couldn’t tear myself away from the news. I watched TV every moment I could. I recorded hours and hours of news coverage; if we ever had a child, I’d have real-time coverage to show them to try to explain what I myself couldn’t understand. I devoured magazine and newspaper coverage about it. I couldn’t stop thinking about the sheer terror the people in the towers must have felt. I couldn’t stop hoping to hear of survivors found alive in the rubble. I couldn’t get enough of the survivors’ and rescuers’ stories, bright spots amid all that horror and devastation. After several days of this, I couldn’t sleep anymore. And I couldn’t stop crying. I’m not sure exactly how many days had passed, but finally Rich cut off my TV watching. I was a mess already, and continuing to watch nonstop coverage was only serving to increase my anxiety. He dragged me out to dinner on my birthday, September 17. It seemed like we were the only people in that Chili’s besides the waitstaff. I dutifully ate my dinner and dessert. I made it through that dinner without crying. I managed to resume a somewhat normal routine. Work. Dinner. Sleep. Socialize with friends. I never was able to shake this increasing sense of dread, this anxiety that was ratcheting up, the feeling that I was waiting for the proverbial other shoe to drop, though. I just knew that my grandfather was going to pass away soon; his cancer had spread, and he’d practically been at death’s door that summer. But he didn’t die then, hanging on for seven more months. Instead, my mom got diagnosed with breast cancer. And I knew then that was the sense of dread, that proverbial other show. It’s what I’d been waiting for. Aside from the fundamental changes 9/11 brought for the U.S. and the world at large, it profoundly changed me. I was born in New York City, and so was my mom, so seeing that kind of devastation wreaked on our hometown … I can’t put it into words. Rich and I made it a point to visit Ground Zero during our April 2002 visit to New York City (Rich’s first), where we paid our respects, where we couldn’t read all the tributes left there through our tears, where I forgot to take flowers. Because you should always take flowers to a cemetery. I can say I was never prouder to be — and still am — a New Yorker than when I saw how my hometown, that beautiful, amazing city left in ruins, stood united and taller and stronger than ever. 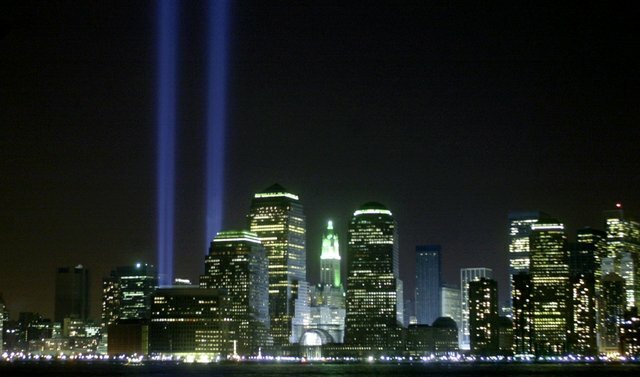 Since I started this blog in 2004, I’ve written about 9/11 a few times. I don’t know if I’ll write about it again next year, or the year after that, or beyond that. But I will be thinking of my hometown, and of D.C., and of those who perished in that Pennsylvania field, on that day, every year for the rest of my life. That I can promise you: that I will never, ever forget.